As a pastor, whether it is from the pulpit or in my writings, it is hard to not limit my communications to things that people want to hear. Most of the time, I try to convey things that are challenging and inspirational. There are times, however, it is tempting to not convey what God is revealing. This is because these messages “don’t preach well” as we say in the pastoral world. Messages that tickle the eardrums put more people in church seats, increase giving, and make more friends. They are safe. 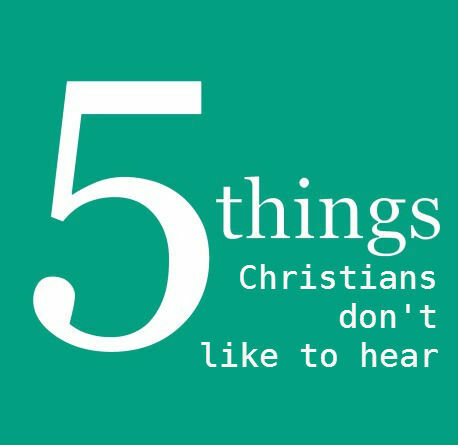 Let’s face it, as Christians, there are things that we need to hear but don’t like to hear. 1. You’re wrong– The fact is, sometimes we as Christians do not have all the answers. The Bible is true. God is all-knowing, but sometimes this power and truth gets filtered through our biased minds and our wanting hearts. Somewhere in the midst, God’s message is lost. Christians know where to find truth, but sometimes our desires or even conditioned thought processes need to be carefully analyzed. 2. You have the power to influence– If we truly believe that the spirit of the living God lives in us then that should have some bearing on the way we interact with others. We don’t like to admit it, but following Christ means something. We have access to the power that created the universe and we are called to be ambassadors for God’s kingdom. This means we are resonsible to see this kingdom is shared. 4. Faith without action is dead– This is Biblical, and everyone needs to hear it. We can not continue to think that going to church and reading in our private study room is what this life is about. There has to be a point where we get out, and express our faith in a way that is concrete. Service, giving, and fellowship are among these things. 5. 10 percent is a good start– When asked about whether believers should give based on their gross or net income, Dave Ramsey said, “considering the average Christian gives only 2 percent, I would say it doesn’t really matter…” This convicted me when I heard it. Jesus was all about increasing the standard of living when it came to expressing the kingdom. Don’t worry…God can keep up. Even though we don’t like to hear some things from time to time, it is good for the heart to be challenged. I hope we don’t simply skip over these ideas and think they do not apply. Let’s embrace what is difficult. Let’s love like never before and grow like we never thought we could.